Takes place over the course of a single evening. 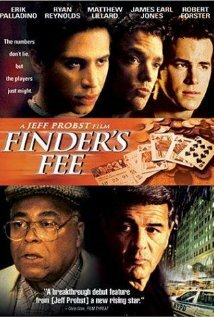 Tepper, (Erik Palladino) finds a wallet on his way home from work. He contacts the owner Avery, (James Earl Jones) to come pick up the wallet -- and then learns that the wallet contains a $6 million winning ticket. Complications arise when Tepper's friends (Ryan Reynolds, Matthew Lillard, Dash Mihok) come over for their regular poker night and discover that the winning ticket is in the pot and it’s anybody’s game. Produced by Katy Wallin - MysticArt Pictures. Finder's Fee - Buy Now! Go to to Amazon.com to purchase your copy of Finder's Fee today!